Ceramic, with hand-painted designs and golden accents. 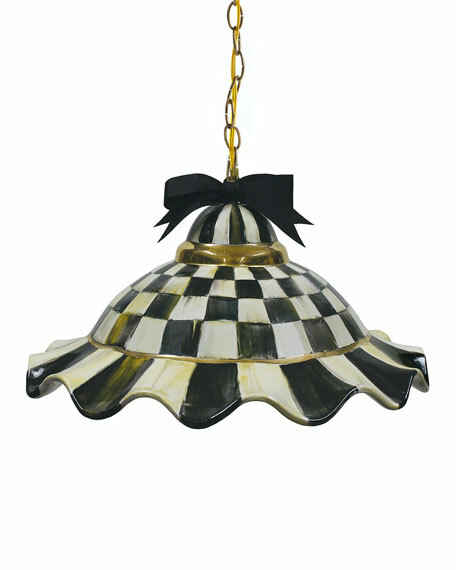 Includes brass canopy and cast-brass hanging chain. EXCLUSIVELY AT NEIMAN MARCUS Ceramic table lamp with crystal base. Hand-painted details. Topped with a round hardback shade in white linen. Shade dimensions: 16"Dia. x 10"T. Uses one 100-watt bulb. Three-way switch. Overall: 16"Dia. x 27"T. Cord length: 6 ft. Imported. Boxed weight, approximately 9 lbs. EXCLUSIVELY AT NEIMAN MARCUS Handcrafted floor lamp. Natural capiz inlay and gold leaf applied by hand. Hand-painted details. Polyester/resin. Uses one E26 150-watt bulb. Linen shade dimensions: 20"Dia. x 13"T. Overall: 20"Dia. x 70"T. Base: 10.25"Dia. Imported. Boxed weight, approximately 30 lbs. EXCLUSIVELY AT NEIMAN MARCUS White ceramic table lamp with blue finish. Round acrylic base. Hand-applied finish. Linen shade dimensions: 16.5"Dia x 11.5"T. Uses one 150-watt bulb. Overall: 28"T. Cord length: 8 ft. Imported. Boxed weight, approximately 11 lbs. EXCLUSIVELY AT NEIMAN MARCUS Round star flower ceramic table lamp. Uses one 150-watt bulb. Linen shade dimensions: 16.5"Dia x 11.5"T.